The International Emmy Awards is my favorite annual event for gala glamour. This year, I went dressed in Adrianna Papell's Art Deco Beaded Blouson Gown in Champagne. Normally I would opt for a black gown but it was a nice change to go with this softer, glamorous look, and the taupe/pink color also went well with my skin tone. The fit was very flattering and I love the beaded scalloped pattern. This gown, like many of Adrianna Papell's dresses, are available in petite and regular sizes and comes in different colors such as Mint, Midnight or Black. You can find Adrianna Papell's gowns at Nordstrom, Macy's and Lord & Taylor. 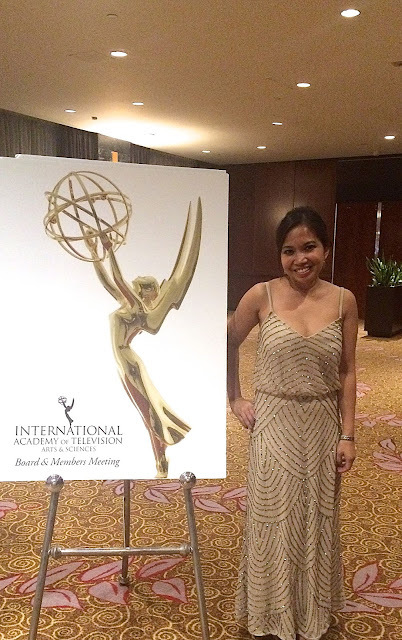 Check out all my photos from the International Emmy Awards here.